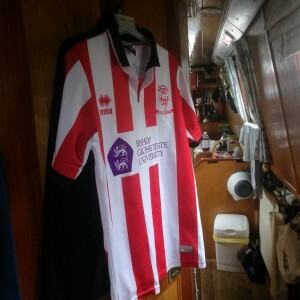 Narrowboating Chick | Just not what we were expecting…. They say the camera never lies, and in reality it doesn’t. However it can give a very different impression. The human mind can also edit their minds eye into whatever is in their mind; that’s what I did with Ambassador. On a rainy Friday afternoon, we found out that Aqua Roma can never be beaten- at least to those who have cruised with her. Dear little Ambassador was the same size, shape, age and eerily similar to Aqua Roma, but she was unloved and needed a lot of money spending on her. That familiar damp smell hit us as we walked in and it was strange to see the different layout- we thought we’d always wanted a permanent double, but in a boat that small, the only true thought is “what a waste of space”! The windows, although new, did not fit to her quirky side and of course produced the water ingress around the interior frames and the rust and bubbled paintwork around the exterior. The wood stove was absolutely gorgeous, but would have made it really hard to fit seating & a bunk in there as well. We left with a lot to think about- we had the desire to buy her, as she could be a lovely boat once again, but £20,000 was just too much for us. Plus we had the survey report to consider, and if that threw up a lot of horrors that we were unable to negotiate a satisfactory outcome, we would have lost £600 just like that. So, Saturday morning found us in McDonalds putting in an offer of £14,000 for Ambassador, which we were sure will be rejected. Ambassador continued to dominate the conversation and thoughts throughout the day. We kept our options open and trawled the internet for other boats for sale- a long and arduous task for those with a limited budgets and shallow pockets. However Marcus spied a boat at Sawley Marina- Harebell. She was a 38ft, built in 1992 by Jonathan Wilson and looked just superb. What’s more she had a £19,950 price tag with those magic words “Offers Accepted” attached. First job Sunday would be to call to arrange a viewing.